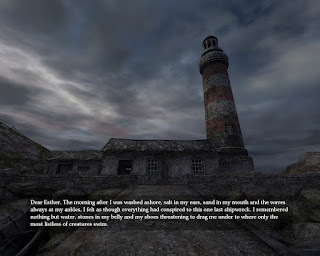 This post originally came out my need to talk about Dear Esther. The thing is, I already wrote about the game back in 2009 and specifically discussed its sensations of solitude. About four years after its release, not a whole lot has changed. It is still a stunningly beautiful game that handles loss and loneliness incredibly well. Everything I said in 2009 is true, if not more so, in Dear Esther's latest iteration. It also fits the topic perfectly, because the game itself depends upon players engaging with and digesting the semi-randomly distributed narrative chunks. This involved putting the audio into the context in which you find it, patching these together in some sort of narrative, and even thinking about how the story and the environment relate to your own life. For a game lauded for its minimalism, it arguably asks a lot of its players. I am also glad I touched upon solitude in Red Dead Redemption and Skyrim, two games that create amazing environments in which my thoughts can wander - itself an engaging act of play. What I did cut were similar feelings evoked by the wonderfully crafted Dark Souls and the "differently crafted" World of Warcraft. Chris Dahlen wrote a fantastic piece that captures my thoughts on these sensations while describing his adventure in Sen's Fortress. While he focuses on difficulty, the personal nature of his story I think highlights the feelings of solitude you'll find in the peaks and valleys of Dark Souls. In fact, the difficulty creates these moments of quiet thought by demanding players both calm themselves down and prepare for the next threat. I mention World of Warcraft because, unlike the others, the "massive multiplayer" element makes those moments of solitude uniquely meaningful - like finding a secluded and serene place to rest in the midst of a bustling city. Flying above the nether, late into the night of a local server, can feel special. The creation contemplative solitude is a valuable contribution to play. Now I really want to play Red Dead Redemption again.